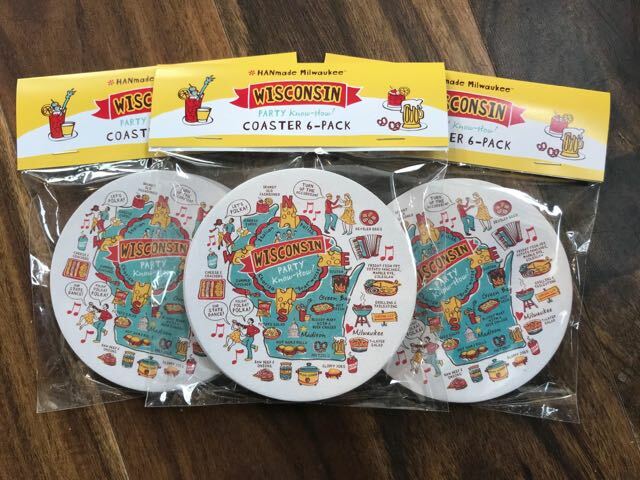 Orange Pops offers dozens of different Milwaukee- and Wisconsin-themed coasters. Published March 15, 2019 at 10:06 a.m. Drink coasters basically have one job: to protect surfaces from a beverage's heat and/or wetness. Secondarily, they are sometimes used on bar tops to advertise brands or to add an artistic flair on a coffee table. And occasionally coasters provide a way to showcase hometown pride. 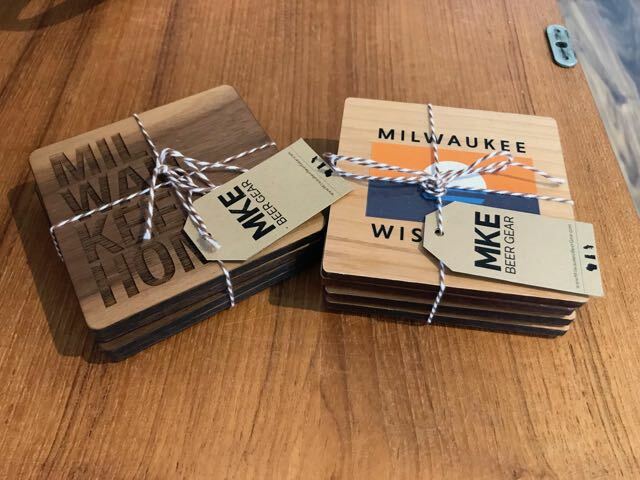 Such is the case with the Milwaukee coasters made by Milwaukee Beer Gear, a company started by Zach and Amanda Wambold in September 2017. "Every stellar home bar should be equipped with a nice coaster set," says Wambold. Made from cherry wood, Milwaukee Beer Gear's coasters are laser-etched. "We loved the grain of the wood and were inspired by the different neighborhoods we know and love," says Wambold. 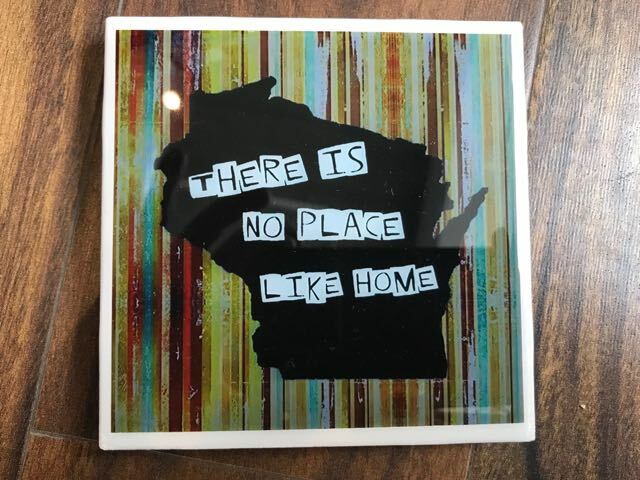 They also make Wisconsin beer ingredient coasters – which include beer's four ingredients: hops, barley, yeast and water – and Milwaukee Flag coasters. The coasters are for sale at The Waxwing, Local MKE, MilwaukeeHome, Hyde Park, Sparrow and more. They also sell them on Etsy and their website. "A good coaster should be unique, high-quality and functional," says Wambold. Leslie Phillips, a local artist who runs a business called Orange Pops, started creating coasters in 2011 and, since then, sold thousands of them. "I make the coasters using images that I create. My images range from city and state themes, to cats, plants and countless others," says Phillips. Phillips' coasters are coated with a high-gloss, resin epoxy finish that makes them appear glassy. "Other coaster makers tend to use Mod Podge or a clear coat acrylic spray. The resin is expensive, but I find it is the only finish that gives me the exact results I need for creating a lasting piece of artwork," says Phillips. Phillips says coaster sales are excellent because they are essentially small, affordable piece of functional art. "A lot of people don't have room for additional large art on their walls, but the coasters work great to add a splash of color to small spaces," says Phillips. "They also make great gifts." Orange Pops coasters are available at The Waxwing, Sparrow Collective, various festivals and through the website. "Although I am best known for my coasters, I consider myself a creative adventurer and like to branch out into all sorts of different media," says Phillips. Hanmade Coasters, a small business started by cousins Colleen McCarrier and Hannah Jablonski, offers a six pack of Wisconsin "party know-how" coasters made from heavy duty cardboard and designs from cheese curds, football, accordions playing polka and beer chasers to deviled eggs and more. "My artistic style can best be described as colorful, whimsical and handmade," says Jablonski. Get Hanmade party coasters here.